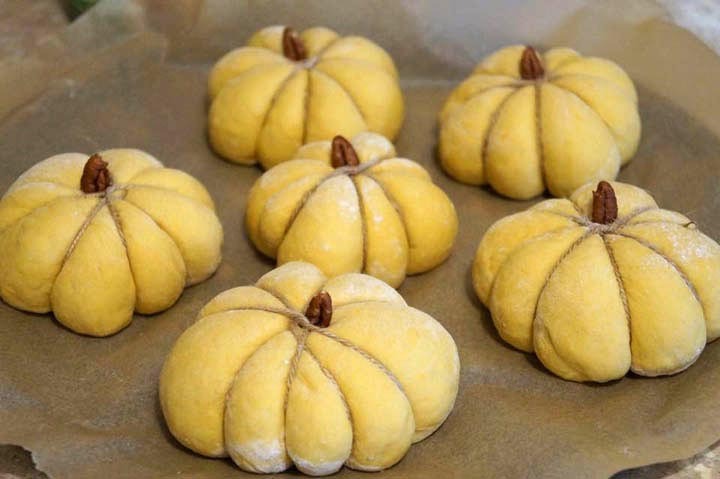 Dear fellow bakers, as I really wanted to involve my 5-years-old daughter and 6-years-old son in the Thanksgiving dinner preparation, last year I decided to make a batch of the delicious pumpkin shaped dinner rolls my neighbor Agnes gave me to try two years ago. Being carnivalesque during the hot summer days doesn’t really mean a lot. 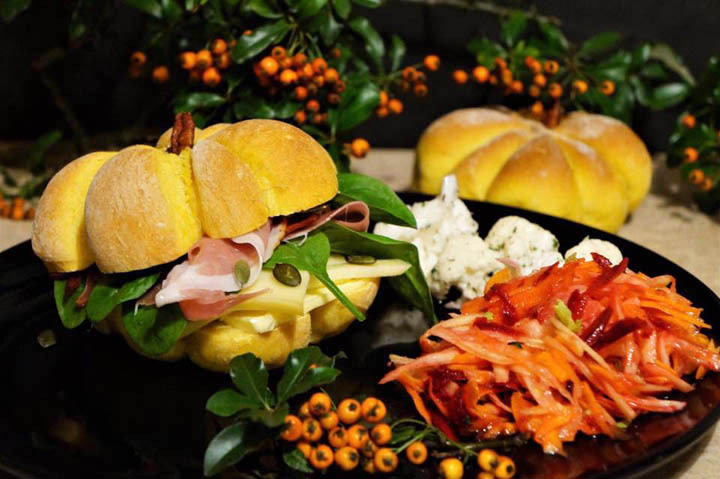 But when the autumn comes around it’s so easy to get inspired by the splendid holiday decoration, crave-worthy dishes, and even the warm-scented candles. We were all quite happy with the result – they were so soft and delicate with a hint of sweetness. 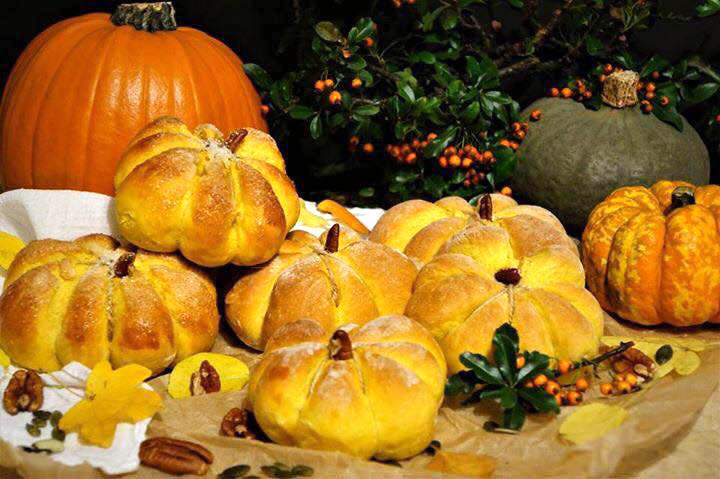 In my opinion, the mini pumpkin buns should be part of every festive dinner table! In fact, they are like a little celebration in your mouth – soft, tender, and divine. You can also use them as fall decoration. Peel the pumpkin, cut and remove all seeds, then slice into small pieces. Steam the pumpkin. Mash the pumpkin or blend it in a blender until it becomes a smooth puree. In a large bowl add sifted flour, salt, and egg. Add instant yeast in warmed milk(note: the temperature of the mixture should not be higher than 40˚C, otherwise yeast may die). Add melted butter, sugar, and mashed/pureed pumpkin. 4. Gently knead with your hands. When the dough becomes somewhat homogenous, use a damp towel to cover the bowl and let it rest in 10 – 15 minutes. 5. After 10 – 15 minutes, knead the dough until it becomes smooth and elastic. The dough is tacky but not sticky when touched with our fingers. *Notes: The amount of flour used will vary depending on water absorption capability of each brand. For this recipe, you will need extra flour. If you are going to knead the dough by hand, in the first 5 minutes, the dough will be quite sticky. But it will get better as you keep kneading. If after a while and the dough is still sticky, add in more flour. 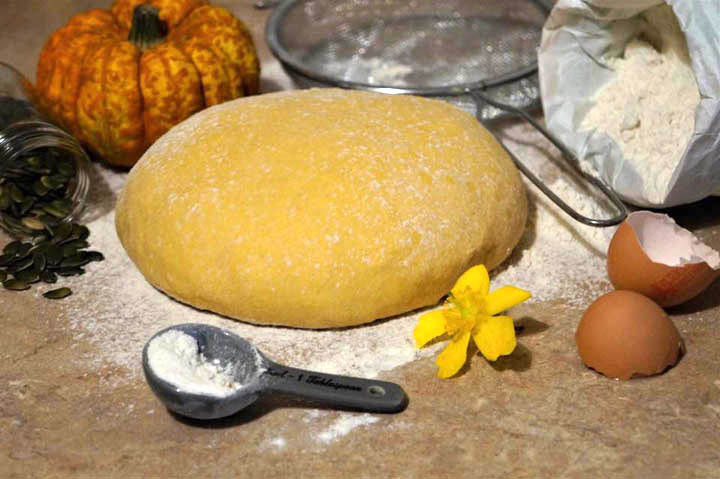 If you go overboard with the flour and the dough now becomes hard and difficult to knead, add in some teaspoons of milk, one at a time, until the dough becomes soft enough to knead (hard dough will result in hard, dry bread that cannot be stored for a long time). You can also use a mixing machine with dough hooks to knead the bread. 6. Grease the proofing bowl with a little oil. Place the dough inside the bowl and turn it around so that it is covered with oil (to prevent the dough from drying out). Cover the bowl with a damp towel. Proof at room temperature until the dough doubles in size. Proofing time will be between 45 – 70 minutes, the dough will proof faster at warmer temperatures. 7. After the first proof, take the dough out of the bowl and knead for another 2 – 3 minutes until the dough is smooth. Divide the dough into 6 equal portions. 8. Shape the dough pieces into balls. Prepare a baking tray that is lined with parchment paper or silicone baking mat. 9. The balls are tied with a cookie thread crossed but not tight, they should resemble the pumpkin. In the middle of each ball is put a piece of pecan, like a pumpkin handle. 10. Place the dough balls onto the tray so that they are about 3 – 4cm apart from each other. *Proof for the second time until the dough rises to 75%. The dough should be covered tightly to prevent them from drying out. *In about 15 minutes, rotate the tray so that the buns are evenly baked. *Notes: Use up in one day or store in an airtight container for use in 2 days. When it is ready, make little pieces and form them as balls. 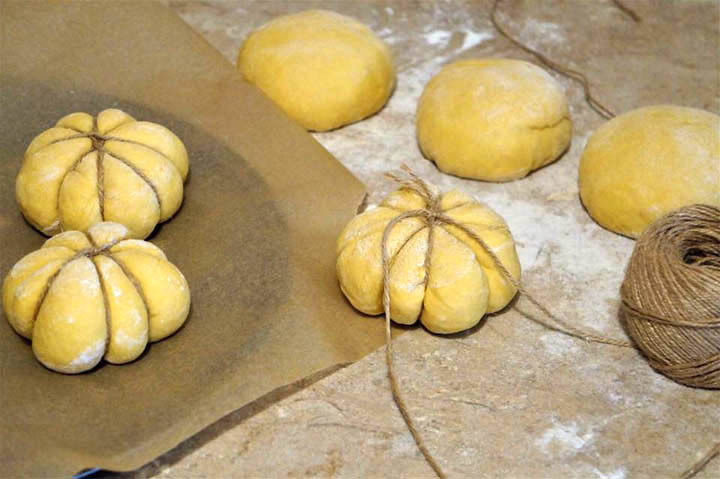 Then shape each of them as a mini pumpkin by using some hemp rope (as shown on the picture below). If someone asks for no carve pumpkin ideas – show them this recipe! 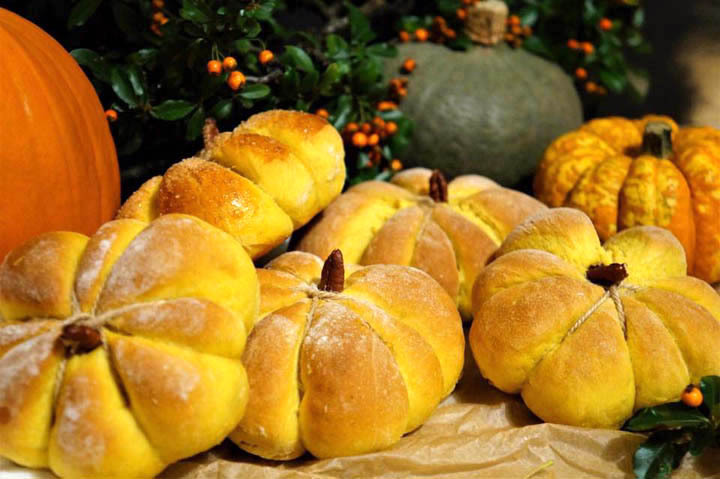 Just an idea – this year for Halloween why don’t you give the trick-or-treaters some freshly baked pumpkin shaped rolls instead of giving them unhealthy sugar candies?